Distinctive features: Tree; Twisty needles in bundles of 2. 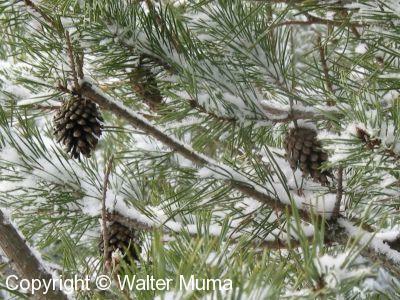  Mugo Pine (Pinus mugo) - a shrub. Habitat: Fields and Open Areas; Open areas, open forests. 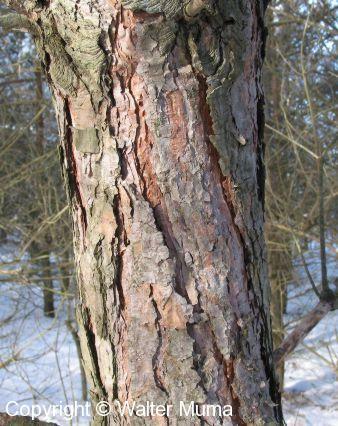 Notes: Scots Pine trees are hardy non-native pine trees. They are often planted and also sometimes grow wild. Scots Pine needles are tough and very pointy. You're likely to get pricked by them! Note how they twist together. 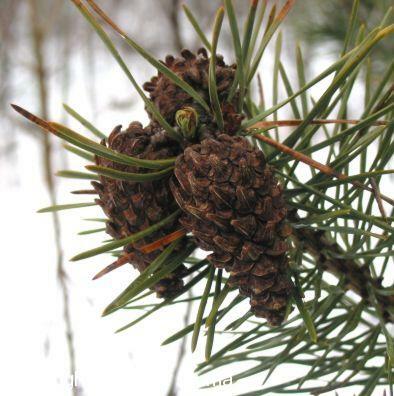 Jack Pine (Pinus banksiana) needles spread apart in a "V" and aren't as twisty. A close-up view of Scots Pine needles. Again, note how they twist together. Jack Pine needles are similar, but they spread apart in a "V". I think these are male cones, but I'm not sure. This photo was taken in the spring (May). Scots Pine cones on the tree in the winter. The cones on Scots Pine point back along the branch. 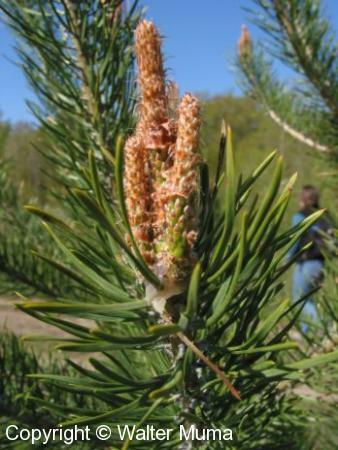 Each cone is attached to the branch with a small stem. 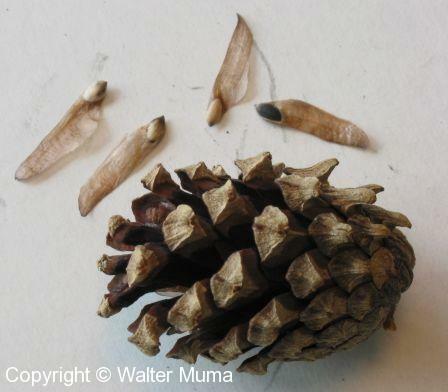 A close-up view of a cone and seeds. All pine nuts (seeds) are edible. The cones have backwards-pointing sharp protrusions near the base. Scots Pine trunk and bark. Close-up view of bark. Note how flaky it is. A couple of pictures showing the shape and form of Scots Pine.